This is a quote I posted on my Instagram, and my when my friend Shiri saw it she told me I should use it as a mantra. I had never really used a mantra before... but that’s what I did. And when I’m stressed, I play this quote in my head, and ground myself and bring myself back to the present moment. When I started my gratitude journal as my last New Years Resolution, I never imagined what a difference it could make. Even on your worst days, forcing yourself to remember just a few things you’re grateful at night, lets you go to sleep with a little more peace. I don’t know one person who hasn’t undergone some hardship that has made them feel broken. But it’s so true. We’re all still standing. It’s like when you drop a glass and it miraculously doesn’t shatter. I used to feel weird when people would tell me I was brave or courageous. Because I certainly didn’t feel that way. I felt scared and confused. But reading this quote makes me feel better about it. How many things have you been scared of this year, but pushed through anyway and survived? That really is courage. I’m personally a very sensitive person. I’m an empath. I care what people think. When someone around me feels pain, I feel their pain. And this is both a curse and a blessing in my opinion. It’s a double-edged sword. Because the words of others can hurt me so easily, but my ability to feel their emotions makes me someone who wants to be there for them. So while I need to harden my shell and learn to let the opinions of others bounce off, I also need to learn to see my sensitivity as an asset as well. I read this quote for the first time this year, and I found it so powerful... because it’s so true. Out of all those things, people won’t remember words, they might not remember actions. But they definitely will remember how your words and actions made them feel. They will remember you by how you made them feel. Look back and see how you’ve grown from each experience you dealt with this past year. You learn, you learn and you learn, and you never stop growing. Thinking back to your hardships, think about how you might have grown and what you might have learned from them instead of how they hurt you. Picture flowers instead of scars. We’re all at different places in life, some of us are a little ahead, and some of us are a little behind. But are we really? Is there really a timeline for life? Everyone is so different, and it’s okay if you’re not going at the same speed that society expects you to go at. None of our paths will be the same. Just because yours is different doesn’t mean it’s wrong. If your intentions are good, but the outcome isn’t, sometimes you have to give yourself a pass. You just have to, because if in your heart you know that your thoughts were well-meaning, you did everything right. Oh how I love this one. You can spend so much time seeking love. Seeking friendship, and seeking nurturing. But what if you’re the one doing the loving? There’s always loving you can do. And it’s so hard to feel badly when you’re pouring out love. I'm wishing you all a happy and healthy new year. 2018, be nice to us! 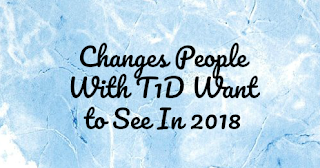 I went on the Beyond Type 1 App and asked my fellow Type 1s and their famlies what they want to see more of in 2018 for Diabetes. I started with a few of my favorite answers, and then went into sections, because there are some things a lot of people can agree about! And there you have it. The people have spoken. What changes do YOU want to see for us in 2018? I’m looking correctly, and I may not be, my last update with you guys about my health was in July. Oops! So as you know, in June some my neurological problems were finally diagnosed as a one in a million disease, Stiff Person Syndrome. 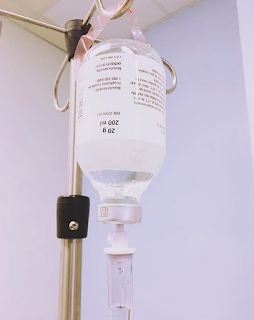 About a month ago I had a 4 day loading dose of IVIG (Intravenous Immunoglobulin). IVIG is composed of the antibodies of over 1000 blood donors! It is used both in autoimmune diseases, and immune deficiencies. About a week and half later, I realized I was having an easier time walking. It was amazing. My wide based walk that had been compared to a very pregnant lady or cowboy was changed. Strangers were no longer staring at my feet. As I walked by store windows and saw my reflection, I looked NORMAL. So I am so happy to say that IVIG worked for me in that respect. In the meantime, I got some other surprising news. A while back I had my lab tests come back with a very elevated copper level. We agreed it could be a red herring or a lab mistake, so we redid it. Only it came back extremely high again, showing copper toxicity. Around this same time, I started suffering from upper abdominal pain. After a week of it not going away I went to the walk in clinic who sent me to the ER. Turns out that in the last 6 months, my liver has become riddled with lesions. They say over 12 on both lobes, I don’t know if they mean that as a total tally or separately. The masses are one of two things, both benign: Angiomyolipomas, or Hepatic Adenomas. I would have liked to do a biopsy now to figure out what they are and treat it in case it's the cause of some of my issues, but the doctor I saw felt it was a risk since the tumors are partially vascular. Interestingly enough, he thought that maybe a diseased liver is what is causing my high copper. It could also be causing my loss of appetite, where malnutrition is slowly beginning to show itself in lab work. And that’s all I’ve got for now. Thank you for caring if you read this! It’s truly appreciated. I’ll start this post with a trigger warning because weights will be discussed in numbers, so if this is something that triggers you, I’d suggest skipping over this one. One of my best friends and I have both been through the ringer when it comes to weight. She has Chronic Intestinal Pseudo Obstruction, and I have Intestinal Dysmotility but we don’t know exactly what parts are involved yet. The point is, we both lost our appetites, generally feel nauseous all the time, she couldn’t hold anything down and we both dropped a significant amount of weight. My weight loss was split into two sections, which I’ll explain in a minute. We were both what some considered “chubby” prior to the weight loss. She’s much taller than me but we were probably around the same size proportionally. During the first section of my weight loss, I was put on Vyvanse for ADD, and lost my appetite. I weighed over 140 pounds and am 5 feet tall. I was at my highest weight ever. With this appetite loss and diversions to certain foods, I lost 20 pounds. I was thrilled with my new body that I did nothing to obtain. I had to get rid of all my big baggy clothes and trade them in for new, smaller ones. I maintained that healthy weight for about a year before my gastrointestinal issues seemed to get worse, which is my current situation. Like I said, no appetite, relentless nausea, and abdominal pain. In the last few months, I lost over another 20 pounds. Now I’m bordering underweight, and am desperate for help in that department. It could be a mix of my liver issues with my dysmotility, or it could be something else. 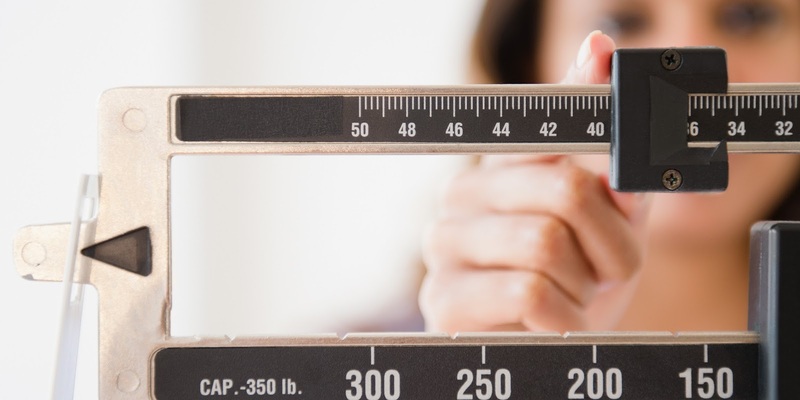 The weight fluctuations that can come with chronic illness are HARD. I had to get a new wardrobe after my first weight loss, and now those don’t fit me anymore. My friend went through the exact same thing. We’ve pretty much been every size of clothing. In the meantime, we’re here thinking... you don’t want to use my diet. The way I lost this weight was not healthy. It also caused months of pain and suffering that I wouldn’t wish upon anyone. And then we have the opposite end of the spectrum. Gaining weight from chronic illness. This is how I ended up at 140 to begin with... my sedentary life due to my illness. But others gain for different reasons. Medications, treatments, nothing comes without a side effect, and for a lot of those it’s weight gain. Some illnesses even cause weight gain. This is the part where we get to talking about body appreciation, and learning to love the skin you’re in. How is one supposed to have time to do the mental work it takes to love your body and feel comfortable the way you are, when your body is constantly changing? You finally get used to one weight, and the next thing you know, you’re having to adjust to something else. Learning to love your body at its highest weight can be a tall task. But over time, it’s doable. Learning to love your body at your lowest weight, well... you may not like the circumstances, but you might be pleased with your newfound small body. The problem is, is that then you get used to it. And as you recover and get the proper medical treatment, or go on a medication that causes weight gain, you can feel every pound that adds on, and it feels weird.... because yet again, you have to adjust to your new body, but you just adjusted to your recent one. And this cycle can repeat itself many times. How, in this day and age, are you supposed to love and accept every part of your body at all different weights? It’s yet another challenge we face that isn’t talked about frequently. To my friends with chronic illness going through this... you are not alone. Learning to love your body one way is hard enough with all the pressure from society, but learning to love multiple versions of your body is another challenge in itself. And I am so proud of every one of you chronic illness ladies and gents who are doing your best every day to try to love yourself the way the way you are. And having to do it over, and over again. 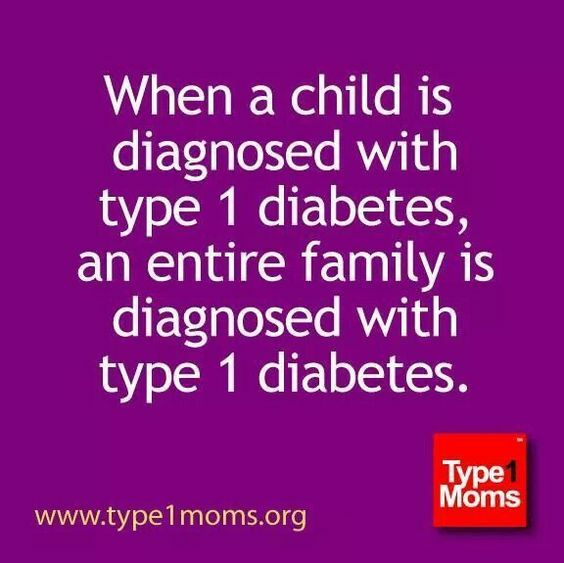 Becoming more and more involved with the Type 1 community and meeting more kids with Type 1, it really struck me how underappreciated the parents of these kids are. They deserve recognition.. I mean.. They're pretty much acting as their child's pancreas! 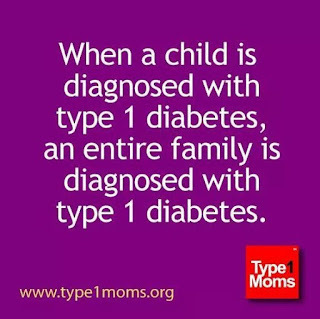 They're responsible for keeping their tiny humans alive with all the complications that can come with Type 1 Diabetes, and it never stops. 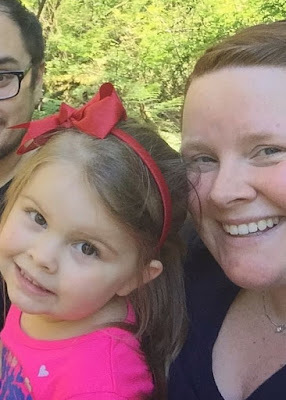 I asked on the Beyond Type 1 App, "Parents of T1Ds, if you wanted the world to know one thing about what it's like being a t1d parent, what would it be?" Here are a few answers that hit me in the heartstrings. "That the diagnosis, especially when your child is so little they can't take care of themselves, is your diagnosis as much as it is your child's." - Danelle E.
How old was Mason when he was diagnosed? How often do you have to get up in the middle of the night? At least 2 times just to makes sure our tech is working. More if he is high or low. How long do you think you can go without worrying about his blood sugar? There’s not a moment I’m not thinking about it. I check my dexcom app about 100 times a day while he is not with me. Sometimes in the night I am jolted awake even if there is nothing alarming. No alarms make me wake also. What else are some of your day to day worries because of diabetes? I think I worry about how he feels physically and mentally. I want him to feel good to run and play like his peers. I also worry about the things he worries about. Often he will ask me what would happen if his blood sugar is zero or 1000. He often asks What if questions. What's the most frustrating thing about watching Mason live with this disease? His desire for a cure. On occasion he will ask me when it will happen. Will he still be a kid? Or will he be old. His pediatrician worries about his physical health. His endo his A1C. His allergist his allergies. And then there is us as parents... we worry about his entire being. It’s frustrating when at times having diabetes can limit what he does. We always want for him to live a happy and full life, but at times it limits what he can do. I hate seeing him sit on the edge of the playground watching kids run and play while he is drinking juice. So it’s a lot. In your eyes, how has it changed him? Mason has always been a little anxious and very aware, but it has made him have a lot of worries. As much as we try and shield him from the scary parts of diabetes it is a part of his reality. He definitely knows about a lot of stuff he wouldn’t if he had never gotten diabetes. How has his diagnosis changed you? I am by nature a very emotional person. So diabetes has been hard for me. Constant worry about something I have little control over. It has made me very anxious. His diagnosis has been very traumatic for me. I have moments of panic and fear. I have meltdown moments (mostly in my kitchen at night while my husband reassures me). I have good moments too where I feel really strong and confident about how far we’ve come. Diabetes is draining and constant. What makes you most proud of your kid? Just that is still a normal kid. He still wants to do everything his friends do despite all the extra work he has to do to keep up. He pushes through even when he doesn’t want to. He inspires me everyday. He has a good spirit and heart. He’s my baby so I’m proud of him no matter what, but since his diagnosis he is just so fierce to me. If you had words of advice for new T1D parents, what would they be? Be organized. Get a binder and tabs to organize all the new informations and lab slips. I also made sure I took a notebook with me everywhere to write down things I was not sure about. Find other Type 1 families and ask for tips and tricks. Let people help you. I had friends that brought us food for dinners that were carb counted; and took Mason’s sister to have fun while we were learning this new life. Find a good friend you trust and train them. You’ll need a break. Try all the technology you are asking your kiddo to wear. Try to continue life as it was before. Don’t worry about every single high number, as you will have plenty of those. Access resources available to you and your child. Take advantage of programs and services. Remember your baby is still your baby and treat them as such. How old is are Eva and Leah? Leah was diagnosed at 10 months and Eva was diagnosed at 19 months. In the beginning we woke ourselves up 2-4 times a night to take Leahs blood sugar as she slept, but now we have a CGM (Continuous Glucose Monitor) and it alerts us to high or low blood sugars. We may still have a night with a high or a low where we get up a couple of times to correct their blood sugar but often we can make it through the night without disruption now. How long do you think you can go without worrying about their blood sugars? We can’t go very long at all. Even with the CGM’s we are constantly checking the data to check for trends of a spike or crash that’s on the horizon. We are concerned of the long term effects to their organs and their overall health being effected due to prolonged periods of high blood sugar. We are worried that they don’t feel well and cant tell us. We worry about their future and what other children will say to them about their diabetes. What's the most frustrating thing about watching them live with this disease? The pain they endure. No child should have to be poked and prodded as much as these kids are. I just want to take the pain away. In your eyes, how has it changed them? Since they were diagnosed so young, there was no “before.” So this is just the way it has always been. It hasn’t changed them at all. How has their diagnosis changed you? It has made me realize that we really have no control over things like this. Nothing we did made them get T1D and nothing we could have done would have prevented it. What I do have control over is how we raise these girls to be amazing, outgoing, life loving people. We can advocate for T1D research and education. I am now extremely passionate about this disease and eradicating it. What makes you most proud of your kids? These girls are my heroes. They endure so much yet always have a smiles on their faces. They are an inspiration to me. Make friends with other T1D parents and T1D educators, they will be an invaluable resource. Advocate for your child, you know what’s best for them. You will learn this new way of life. You can do this. Breathe. She is two years old. How old was Zoe when she was diagnosed? Zoe is 1 year old when she was diagnosed. I have to get up at least twice in the middle of the night or it depends if her blood sugar is stable. We are thankful that we got Dexcom last month. It helped us a lot. How long do you think you can go without worrying about her blood sugar? I don't think I could last a day without constantly checking her blood sugar. She is too young and I still worry a lot. That she will be too low or too high because I know her mood also affects her blood sugar. It is a challenge for me as a parent to know how she feels and a toddler is hard to control most of the time. What's the most frustrating thing about watching her live with this disease? It frustrates me to see her cry when I need to prick her little fingers or give her a shot. I also feel bad that she is not living a normal life. In your eyes, how has it changed Zoe? I feel like she thinks that being poked is a normal thing to do. I know that one day when she gets older she will understand everything. How has her diagnosis changed you? At first I was so overwhelmed and it was so hard but when I think about how strong she is..I have adjusted slowly and I know I have to be strong for her. I'm so proud of her for being so brave and strong. She is now learning to be more friendly and happy. After she was diagnosed we stayed in the hospital for 2 weeks and she was scared to see other people because she thinks that everyone will hurt/poke her. She was afraid of nurses and doctors. But now she is more calm and happy. If you had words of advice for a new T1D parents, what would they be? At first it will be very hard but when you think about your child nothing is too hard and the love for your child will give you the strength to do everything. Always remember that you are not alone and that everything will get better each day. He'll be 4 in January. How old was he when he was diagnosed? Diagnosed August 22nd 2016 at 2 1/2 years old. I check him every night at midnight as my standard schedule. If he's sick, been running high or was low at bedtime I will check him again at 3am. He has a CGM, so that has reduced his nighttime lows quite a bit, but his pump will still alarm and wake me up if he is too high or low overnight. Not very long honestly. I check his CGM pretty frequently - maybe every 1/2 hour or so - just to make sure his blood sugar isn't dropping or climbing too quickly. As my husband so aptly put it "What's going to happen today?" The most frustrating aspect of diabetes is how inconsistently it behaves. You can do the exact same thing 3 days in a row and have wildly different results and blood sugars. Eating and exercise affect blood sugars and those are things we can largely control or at the very least know how to manage fairly well. But when you throw in illness, growth spurts, hormones, stress - it seems like everything affects blood sugar levels and we're sometimes chasing the disease and trying to react rather than being able to be proactive about insulin needs. Right now, since Henry's only 4 and we're able to have me stay home full time, our worries aren't as heavy as if he were in school or daycare. And we're extremely grateful for that. Camila turned 4 in October. How old was she when she was diagnosed? She was 2 years and 9 months when she was diagnosed in July of 2016. I remember taking her to the clinic for a follow up and mentioned that she was drinking water and using the restroom excessively. How often do you have to get up in the middle of the night? How long do you think you can go without worrying about her blood sugar? I get up at least once in the middle of the night to check her ‪at 2 a.m.‬, and I worry about her blood sugar all day and all night, although, I never let it show. I have to remain calm and firm at all times, Camila relies on me to let her know that she is o.k., after I check her, she always ask, "am I fine, mommy?" and most of the time she is. I don't like that I have to check her BG several times a day or that I have to give her numerous insulin shots. That is the most frustrating thing about watching Camila live with Diabetes and knowing that it is indefinite. As a mother, you want to take the pain away, in a heart beat, I would trade places with my little girl. In your eyes, how has it changed her? As far as how has it changed her, honestly, I dont think it has changed her, per say, it just changed how she goes about her life. Camila is free spirited and a very happy child. She knows that she has to wait to eat her meal because her BG must be checked and that she has to receive and insulin shot for what she eats. Life goes on as usual, she has four older sisters and one younger brother that she loves to play, dance and have fun with. When Camila was first diagnosed, it hit her father and I hard, we had never heard of type 1 diabetes before and noone in our family had either. We started to read and research to learn more on managing our daughter's new way of life. We work on exercising frequently and we are more aware of labels and of counting carbs. Camila's resilience and her courage is what makes me most proud of my daughter. Every day, day in and day out, she doesn't complain. She knows that her body is different from her siblings and that she must have her insulin shots, and she gets to choose the spot. Sometimes they go in her tummy and sometimes they go behind her arms. I then give her a kiss where I give her shot, I hug her and I tell her " you are so brave," and she smiles. If you had words of advice for a new T1D parents, what would they be? My advice for new T1D parents would be to take it one day at a time because when your child first gets diagnosed you are bombarded with information. Too much information. You wonder if your child will be o.k. and if you will be able to take care of them adequately. You will, it will take trial and error but in time you will become an expert in your child's care. Also don't be afraid to ask for help and don't forget to take care of yourself aswell. How old was Isa when she was diagnosed? I actually worry more about other kids teasing her or her being asked something that makes her uncomfortable or embarrassed. What's the most frustrating thing about watching Isa live with this disease? It’s frustrating to watch her (and us) do everything the exact same way from day to day and get very different results. I’m more stressed and tired than before. However, her diagnosis has given me something significant to work towards that I am truly passionate about: a cure for this disease. Her resilience. I am in awe of the way she faces the challenges put in front of her each day. She is one of the most amazing humans on the planet in my eyes. T1d parent: This will be hard. Like, ugly cry in the bathroom hard. But you need to be strong and take care of your child AND yourself. Don’t forget about you. Self care is not selfish, it is necessary to be the best caregiver to your child, which is just what you’ll be. You can do this. Caelan is a very active 8years old. How old was Caelan when he was diagnosed? 18 days after his Birthday, just a few months ago, one week before starting the 3rd grade. My husband manages a store and I'm fortunate enough to be a work from home mom and be available to take the front seat in Caelan's care, for the most part. This means that on most nights, I get up just once or twice. However, I've taken to staying up until I feel he is going to last through the night without crashing, which can easily draw into 2 or ‪3am‬, before even attempting sleep. Then I just nap while he is at school. This is easier for me than waking up multiple times during the night. I'm a night owl anyhow and have struggled with insomnia for most of my life, so this method seems to be the most logical solution. It has caused my internal clock to scramble a bit and makes things a bit difficult when it comes to weekends and spending time with my husband. Even with this "system" some nights his cgm alarms go off constantly and I just cat nap by his side between corrections and fingersticks to verify the Dexcom. I'm really not sure how to answer this question, because I doublt there's assign a thing for a parent...I honestly can't think of a time that I'm NOT worrying about it to some degree. The Dexcom helps tremendously, but if I'm not actively checking that, I'm mining every medical journal article, book or support group trying to learn everything I can, during every waking moment. In a way, I guess that qualifies as worrying about it too, doesn't it? School, mostly. We are currently struggling with the way his body responds to activity. For instance, immediately following lunch, his class has a 15min recess. Without fail, even when we cut back on on his meal bolus, he crashes, hard and fast because he plays just as hard, and just as fast. Unfortunately, due to his ADHD, many times he is symptom unaware. This is where the Dexcom comes in most useful. Even if he is having too much fun to pay attention to the alarm, his classmates or teacher hear it and get him to the nurse, or I catch it and call her. We are blessed to have an amazing ally in our school nurse and love her to pieces. We also have a situation where his school Administration has had very little experiences with students with T1D and we are having some struggles regarding the nature of T1D care and that it is planned that the parents handle most of the decision making and care, and not every absence is going to be accompanied by a doctor's note. This is definitely something parents need to consider when negotiating their child's 504 or IEP. It is the one big thing that got left out of ours and we have been seriously regretting it. What's the most frustrating thing about watching Caelan live with this disease? Caelan is this amazing, free spirit with an unbelievably sweet, giant heart. It bothers me how often he's apologized for "getting Diabetes," and many other statements like it, particularly on long nights. It doesn't matter how we explain it to him, he still seems to feel like it was something he failed at, that led to our new life. Watching him as he evaluates the activities he loves and then holding back because of the fear of this disease that we are just getting to know, hurts. Kids shouldn't have to think about these things, I miss the freedom and reckless abandonment he used to have about him. Occasionally I see shades of that boy still, but T1D is now always there. We have explained that he can continue to be himself, and he's working towards this "new normal" we keep hearing about, I guess it just takes time. C went from being the kid that it took 2 orderlies and a stressed out mom to pin down for an iron check or vaccination, to doing his own fingersticks and injections in just 3 days. I knew he was capable, because he's always been easy to reason with on the really important stuff, especially if you can explain the science and reason of it all, but the rate in which he has matured around all of this is both admirable and slightly alarming. Wow...well, for starters, I "math" a lot more than I ever did before, LOL. I have a learning disability called Dyscalculia. It affects even basic mathematic ability, time perception, name to face recognition and other logic functions. It has led to some anxiety issues that are sometimes very embarrassing and hard to conquer. That said, Caelan is VERY proud of himself when he's able to "out-math" me, though I've certainly improved. Also, I've lost around 12lbs, albeit not in the healthiest of manners. I am often SO occupied in planning and calculating what HE'S eating, making sure his bolus is right, then making sure he consumes enough carbs in the window of time that the insulin is still effective, in order to avoid a high or low following the meal, that it is not at all unusual for me to forget to eat altogether...I'm working on that one. I can say there have been a few positive changes as a result of his diagnosis,if you can believe it. It has certainly made us more AWARE of our diet and the quality of nutrients we consume in general. It is almost impossible for it not to, so it stands to improve our health overall as a family. It has also brought is back to the dinner table. In order to curtail distractions during mealtime and avoid allowing his eating habits, previously very slow...more like grazing, really, from causing issues. It is easier to get the whole family to sit down and focus on what's important: fighting this fight together. Find support. Discovering another local mom (who happens to have two amazing 10yo twins with T1D) and the various online support groups I've found have been a lifeline for me. This disease has a way of leaving you (and your child) feeling isolated and overwhelmed on an incredible scale. Since we didn't have a hospital stay following his diagnosis, we even missed out on any of the classes people talk about and any opportunity that they would have given us to meet other families who are familiar with our struggle . Thankfully, as my husband would inform you, I don't possess a shy bone in my body and have no problem reaching out. Knowing that we are not alone and that somewhere, probably closer than we know, there's another parent sitting up all night with their sweet child, wondering Why? and praying for a cure, is a tremendous comfort, as sad as it is. How old was Kinsley when she was diagnosed? It all depends on the night. On a night, she is running low or high or dexcom hasn’t been accurate it can be 4 to 6 times. If numbers are in range and dexcom has been accurate I still get up 2 times a night to do a finger poke check. Honestly, it is always on my mind. I can’t really say the worry ever goes away. I worry about how a meal will affect her numbers. How her activities for the day are going to affect her numbers. I worry when she goes to sleep and pray she doesn’t drop low. I worry about her getting sick and if she does what will it do to her numbers. I worry about her future and what complications this disease may cause her. I worry about her getting teased by other kids because they don’t understand the disease. Honestly the list could go on and on. The worry can consume you some days. The most frustrating thing for me is that there is no cure and I can’t “fix” this for her. She is so little and goes through so much daily and it frustrates me that I can’t change that for her. In your eyes, how has it changed Kinsley? I really can’t answer this question. She was only 12 months when she was diagnosed. She doesn’t know a life without diabetes, so it really didn’t change her. This is both a good and bad thing. People always say how nice it is that she doesn’t remember life pre-diabetes, which yes is good in some ways but in other ways if I am being honest I feel robbed. Like I didn’t get to experience the care free life with my child without diabetes. We only got one year without finger pokes, injections, site changes, dex changes, highs and lows. It can really get me down, but then I remind myself that my child is alive and is living healthy with this disease. Things for me changed quite a bit, both good and not so good. This disease put a lot of things in to perspective for me, like what the important things in life really are. It has taught me to not take things for granted and more importantly not take my time and life with Kinsley for granted. The one negative thing this disease has changed about me and it’s something I don’t talk a lot about is my anxiety. I never suffered from anxiety until she was diagnosed. Now I struggle with it daily. This is hard to put in words. She completely amazes me every single day. To go through what she goes through daily and to not let it get her down makes me so proud. She wakes up every day with a smile and a zest for life that I wish everyone had. Even on the tough days that I let break me, she stands tall and takes it all with stride. Kinsley is my superhero! If you had words of advice for new T1D parents, what would they be?The best advice I could give a new T1D parent would be to remember that their child is stronger, braver and more resilient than they ever thought they could be. I would advise them to take every blood sugar number as learning opportunity. As parents, we can get so caught up in having “good numbers” that it can drive us crazy. For instance, learn from the high, what did the child eat and how did affect the blood sugar and how can we change it so that it doesn’t happen next time. I would tell them that it’s okay to cry. It’s okay to be angry. It’s okay to mourn the life you thought your child was going to have or the life you thought you were going to have with your child. These things are all normal.